Winter has started to set into Charleston. We knew it would eventually get here but we thought we'd have a few more days of warm weather. 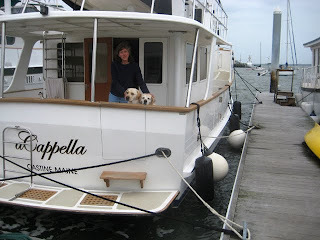 When we arrived back after visiting Karen's family for Christmas, I reconnected the water to the boat. Sure enough, the hose was stiff and difficult to manipulate. That means one sure thing for us - it's time to leave for a warmer location. Getting ready to go means we need to re-provision. We've been out for over 4 months and ran out of our supplies of food. With a supermarket a block away in Charleston, it wasn't a big deal. But now we'll be vagabonds for the upcoming months and it's time to load up on all the important things we need (notice the multiple large boxes of Pita Bites). Before returning the rental car we used it to go shopping at Wal-Mart and Sam's Club. Sam's especially is great for buying month-loads of meat. Some $400 of groceries later, our freezers are full. 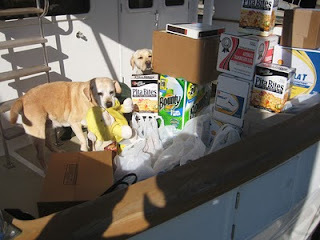 The kids were extremely interested in each and every bag brought to the boat. Now there are just a handful of small projects to complete before we're ready to head toward Georgia, Florida, and wherever the seas take us. It has been nice to be in a city this close to the holidays. Each day we walk the streets of Charleston looking for places we haven't seen. Slowly over the past couple of weeks wreaths, lights, and Christmas trees appeared. The beautiful homes of Charleston became even more beautiful. The stores are decorated and the coffee shop has Eggnog Latte as the special. 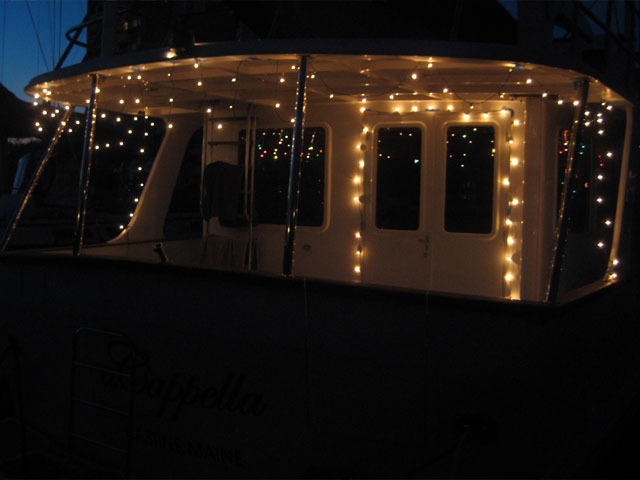 Several boats in the marina have lights, including ours. Marion Square in the center of Charleston has the most impressive display. Tuesday we leave for my parents for Christmas. Once again we will travel by land to spend time with loved ones. Fortunately, the crew travels well by land or by sea. 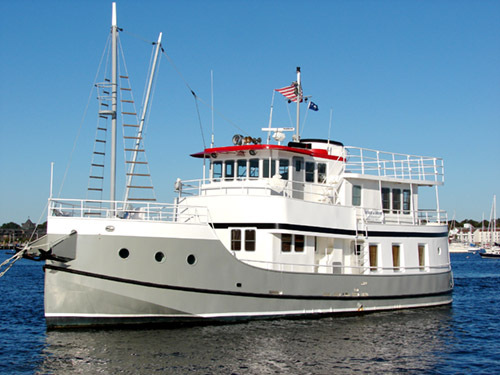 Our friend Bill Corbett arrived on Spray last week with an original reservation at the Charleston Maritime Center for 2 nights. That turned into 3 nights and then into an entire week. It's one of the "problems" with Charleston. It's so nice that it's hard to leave. The Harris Teeter grocery store is a couple of blocks away and all of downtown Charleston is just a couple of blocks further. It's all walking distance. This morning Dyna and Dylan had a last romp with Riggs in the field. 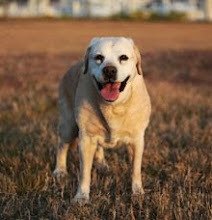 Riggs is an amazing ball retriever and can easily outrun young Dylan on every throw. That's pretty incredible because Riggs weighs only 14 lbs. But boy can he move! Prior to Bill's departure this morning, we made breakfast from a recipe that Bill gave us when he made it for us last week. Forevermore on aCappella, this recipe is going to be called, "Bill's Frittata." Bill took off from the marina at 9:30 am heading south toward the continuation of the ICW. He plans to head down to Stuart and across Florida on the Okeechobee Waterway. 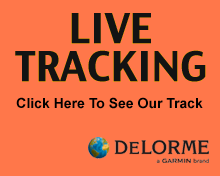 Once on the west coast of Florida at Ft. Myers, he'll head south again toward the Keys turning north at Key West and then back up the east coast. - Cook onion covered with olive oil over low flame until very soft and brown (add a touch of salt). - As onion is getting close to done, add red pepper and keep covered(add a touch of salt). - As red pepper is getting soft, add mushrooms and keep covered. - When vegetable mixture is soft and sweet, hand beat eggs and milk adding salt and pepper to taste - add to cooked vegetables and cover. - When eggs are setting, add cheese crumbled evenly. One of the attractions of the Charleston Maritime Center is the huge field just a block away. It turns out it's an off-leash field for dogs. Several dogs gather there every morning to romp and play. It's a wonderful sight to watch. 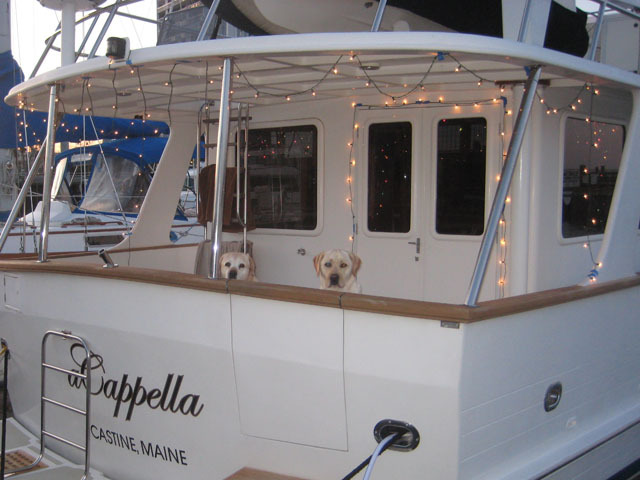 Dyna and Dylan's favorite Charleston friends are two yellow labs, Huck (short for Huckleberry), age 10, and Goose, age 2. They even match each other in color! Needless to say, with a week of on and off rain, these morning outings have led to piles of muddy towels. A small price to pay to bring those we love so much joy. A really cool thing about the Maritime Center is that the laundry facilities are free. That gives us access to a regular sized washing machine and dryer for the messy dog things. It's a very nice touch that few marinas provide to transients like us. The weather earlier in the week was cold - 45 degrees at night! We're now back up in the mid-70's wearing shorts again. Lastly, we just acquired the domain takingpaws.com! We currently set it to forward directly to this blog so just use takingpaws.com from now on. It gives us the flexibility to build on the blog. But mostly, we just like the name. If you're a boater, you've most certainly run across a drink called a "Dark and Stormy". Since we have excellent supplies here in Charleston, we decided to give it a try. We shouldn't have. To make the drink, you put a shot of dark rum over ice. Then add ginger beer "to taste" which is difficult if you've never had one. Add a slice of lime and you're done. It's simple to make. 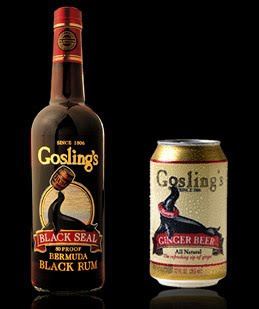 Gosling's Black Rum from Bermuda is supposed to be the official rum to use. That was easy to get in a wonderful liquor store right across the street from the Harris Teeter grocery store. We also picked up a bottle of Sailor Jerry's spiced rum. If we're on a boat, we should have a good supply of rum, right? We couldn't locate Goslings ginger beer but we did find Goya Jamacian ginger beer at the grocery store. The secret of making a good drink appears to be using real ginger beer and not a ginger-flavored soda. We met up with Bill who is still at the Charleston Maritime Center. He was supposed to originally stay for 2 nights. Then he signed up for the week. He's now showing us the calculations for a monthly stay. I understand there are condos for sale next to the marina too. Anyway, we all went out to a wonderful Thai restaurant called Basils and then back to our boat for a movie and Dark and Stormy's. It was the first one any of us had ever had. I have a feeling, there will be many more to come. Today is a stormy day. There are small craft advisories out and even a tornado watch. Seems like a good day for chicken soup. So we're getting ready to have lunch when I check on the progress of Bill Corbett aboard Spray. 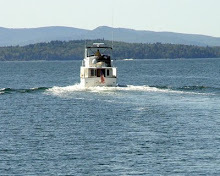 Bill is a friend of ours who left Castine in late September on a mostly solo cruise along the east coast and ICW. He was supposed to show up at the Charleston Maritime Center tomorrow and we've been looking forward to his arrival. Checking his SPOT tracker (he has one too) showed that he was entering the Charleston Harbor. How could this be? So I called him on the phone and he tells us something about bad weather and coming into the marina early. Ten minutes later he arrives and we all share Karen's famous chicken soup (with matzoh balls). Our December cruise was completed without a hitch. We pulled out of the City Marina at 9:30 am and arrived at the Charleston Maritime Center by 10:00 am. We've had more difficult days. Large tents were being put up and it turns out a Chili Cook-off for the Charleston Humane Society was happening in the afternoon. We took Dyna and Dylan for a walk where they got to meet several of the dogs in attendance. There's a large field about a block from the boat where the kids can romp. Great restaurants, grocery shopping, video rentals, and other attractions are walking distance. In the evening we look out over the beautiful lights of the Charleston bridge over the Cooper River. By early evening there was a crowd gathering on the pier beside our boat. We remembered that this was the night for the Christmas Parade of Boats. It started with kayaks, canoes, and shells decked out with lights. The larger boats soon followed, many with quite elaborate displays. We were able to watch a bunch of boats pass before being picked up for dinner by friends. The Maritime Center is very different from the City Marina, both great facilities with their own charms. We look forward to exploring Charleston from this side of the city for a while. Wednesday called for gale force winds and driving rain here in Charleston. They predicted gusts up to 70 mph, the strongest we've experienced during this cruise and the possibility of tornados. We woke to pouring rain, so much rain it filled a bucket under cover on the cockpit with inches of water. Charleston streets were flooding. The winds were to come later in the day so we deployed almost every line we had (8 in all), put out our large ball fenders, and stowed anything that wasn't tied down. We instructed the crew on storm procedures and waited. The winds did howl but our wind indicator only showed a top speed of 35 knots. Hey, this crew survived a micro-burst 2 years ago - this was nothing. By Thursday morning we were back to preparations for our departure on Saturday. Yes, after over 4 weeks here at the Charleston City Marina we are about to start cruising again. This cruise will take us a grand total of 4 miles around to the other side of Charleston to the Maritime Center. Even though it's just a short hop, we need to pretty much do the same prep as a full day's cruise. In addition, much of our time here has been spent on some projects which left the engine room in quite a mess. For the true geeks at heart, Jeff has proudly made an engine room video. Get the popcorn.